We offering unmatched and exclusive range of under counter refrigerator, Commercial under counter refrigeration to the client. With better storage capacity, consistent cooling, high strength body, low power consumption, long service life as well as backed by our highly skilled Professionals Team. 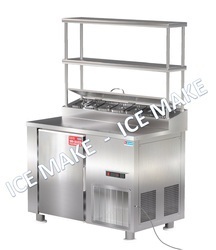 Highly recommended in Hotel Industry, we deliver quality range of Under Counter Refrigeration/Serving Refrigerated counter that is best suits the needs of client. 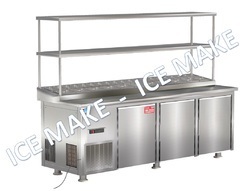 Our range of Under Counter Refrigeration can be an ideal solution for any industrial usage specially designed to accommodate or place below a counter, these are available in customized according to the client’s requirement. These kind of refrigerators are easy to install and consume less electricity. Insulation: Thickness 60 to 75mm, Insulation Poly Urethane Foam (PUF) CFC free. Compressor: Hermetic type with suction gas cooled motor, equipped with overload protector. Power Supply: 230 Volts 10%±, 50Hz, 1 Ph.440 Volts 10%±, 50Hz, 3 Ph. We are offering Under Counter Refrigerator and Pantry Freezer. 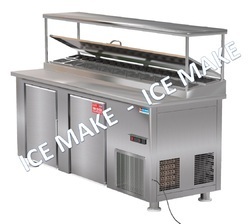 Application: Take your operation to the next level in food preparation by utilizing the benefits of UCR, widely used in Hotels, Restaurants, Bars & Fast-Food Chains. Density: 40±2kg/m3, all Body PUF pouring by automatic imported (SAIP) machines. Designed to suit local conditions made. Tough compared to other local & imported standard manufacturers. All appliances can be made as per client's specification on demand. Our appliances are tested for well-balanced system design, energy efficient, long lasting performance and low maintenance. Highly recommended in fast-food industry, we deliver quality range of Under Counter Refrigeration that is best suits the needs of client. Our range of Under Counter Refrigeration can be an ideal solution for any industrial usage specially designed to accommodate or place below a counter, these are available in customized according to the client’s requirement. These kind of refrigerators are easy to install and consume less electricity.